Melaka or Malacca was inscribed in the UNESCO World Heritage List last year together with George Town as the Historic Cities of the Straits of Malacca. So I was elated Tourism Malaysia brought us to Melaka for this trip since it's been quite a while since I last visited. I'd been here several times before but just like George Town in Penang (which I got to visit just a month before), it's nice to visit after it's been declared a UNESCO World Heritage Site. We made the rounds of the historical sites and had the local Nyonya food for lunch. According to UNESCO, "Melaka and George Town, historic cities of the Straits of Malacca have developed over 500 years of trading and cultural exchanges between East and West in the Straits of Malacca. The influences of Asia and Europe have endowed the towns with a specific multicultural heritage that is both tangible and intangible. 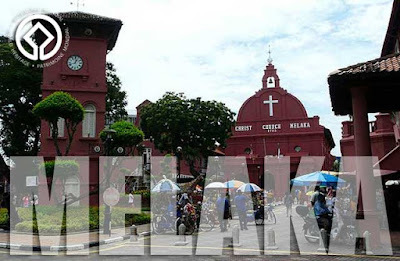 With its government buildings, churches, squares and fortifications, Melaka demonstrates the early stages of this history originating in the 15th-century Malay sultanate and the Portuguese and Dutch periods beginning in the early 16th century. Featuring residential and commercial buildings, George Town represents the British era from the end of the 18th century. The two towns constitute a unique architectural and cultural townscape without parallel anywhere in East and Southeast Asia." 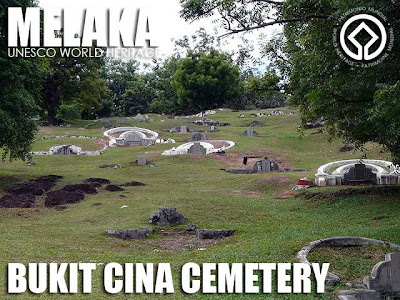 Our first stop before entering the historic core of Melaka was the Bukit Cina Cemetery which is located in Bukit Cina and two adjoining hills. This Chinese graveyard covers over 250,000 square meters and with over 12,000 graves, some of which date to the Ming Dynasty, is said to be the largest Chinese cemetery outside China. Another popular stop entering old Melaka is Sam Po Kong Temple. But since we didn't have much time, we skipped this one. A popular attraction beside the temple is Hang Li Po's Well. They say anyone who throws a coin into the well will return to Melaka. I did the last time, and look who's back! 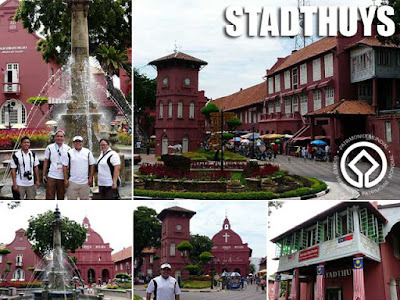 At the center of old Malacca is Stadthuys, said to be the oldest Dutch building in the east, a town hall built by the Dutch in 1650 to house the office of the Dutch Governor and Deputy Governors. The square, which is also known as Red Square because it is surrounded by port-red structures that also include a clock tower and Christ Church. Christ Church was completed in 1753. Inside this Dutch church are 200-year old pews, an altar painting of the Last Supper on glazed tiles, as well as 15-meter beams each made from a single tree. 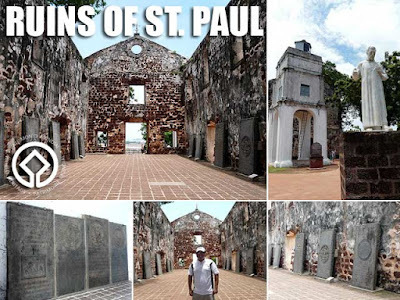 From there, we walked up the hill towards the ruins of the St. Paul Church. A statue of St. Francis Xavier stands in front of the ruins, a reminder that the saint was temporarily buried here in 1553 before being transported to Goa. In fact, the open grave where he was buried is still at the back of the church. 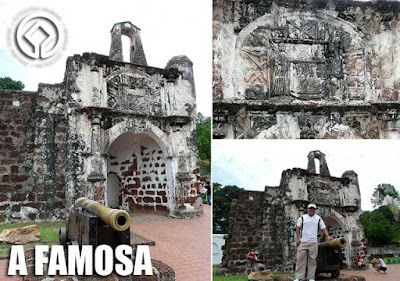 Down the hill, on the other side, is the Porta de Santiago, the only part of the Kota A Famosa left standing. The Portuguese had originally built this fort in the early 1500s. It became a Dutch fort in 1641, and was later handed over to the British in the early 19th century. Wary of maintaining fortifications, the British ordered its destruction in 1806. But thanks to a timely visit and intervention of Sir Stamford Raffles who had a passion for history, this gate was spared. When it comes to food, don't miss the Nyonya cuisine which is unique to Melaka/Malacca. The Baba-Nyonya are the Straits Chinese, descendants of very early Chinese immigrants who partially adopted Malay customs. Another collective term for these immigrants is Peranakan which refers to descendants of foreigners who had assimilated into the local community. There are Indian Peranakans called Chitty and Eurasian Peranakans known as Kristang. In the Philippines, we had the Mestizos de Sangley, with Tsinoy as its modern day equivalent. We had lunch at Seroni Nyonya Cuisine Restaurant (more on this in another post) before exploring more of the historic core. 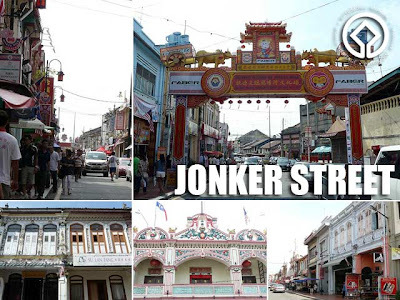 We visited the Kampung Kling Mosque and the Cheng Hoon Teng Temple in Jalan Tokong before shopping at Jonker Street. 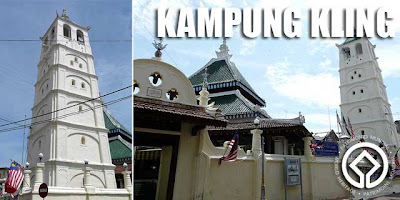 The Kampung Kling Mosque sometimes spelled Kampung Keling, was built by Indian Muslim traders in the 18th century. 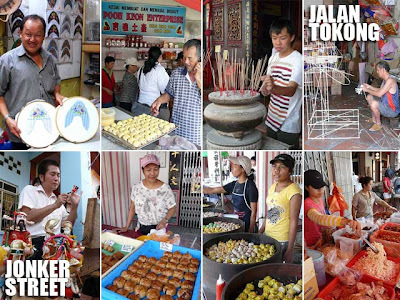 Along Jalan Tokong, notice the traditional craft shops which include those large paper figurines they burn during funerals as well as the beaded-slippers which cost at least RM700 per pair! 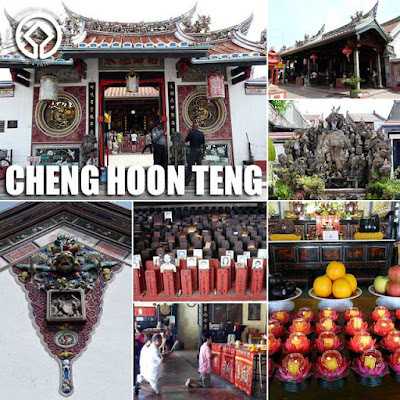 The Cheng Hoon Teng Temple, also along Jalan Tokong is the oldest functioning temple in Malaysia. While primarily a Buddhist temple, the temple complex is also said to host prayer quarters dedicated to Taoist and Confucian practices. The main prayer hall is dedicated to Kuan Yin. While additional smaller prayer quarters added later were dedicated to the Taoist gods of wealth, longevity and propagation and ancestral tablets. Jonker Street or Jalan Hang Jebat is a cluster of shops and other old structures that currently houses restaurants, art galleries, antique and souvenir shops, as well as traders of traditional items: goldsmiths, watch repairers, clog makers and beaded shoemakers, blacksmiths, rattan and bamboo weavers, Chinese traditional medicine merchants and food outlets. If only I wasn't so full, I would have tried a little bit of everything the hawkers along Jonker Street were selling. The street food really looked good, and I'm sure it tasted good too! We drove back to Kuala Lumpur at about 4 p.m. and since it was a free night, I decided to get some rest for the fun planned for our visit to Genting Highlands. Hi Ivan. How are you? This is my first visit to your blog that I came across when I was looking for an article about Melaka or Malacca. I'm Malaysian and love to read travel articles especially about Southeast Asian countries. And I was impressed on how you elaborated the stories about your visit in Malacca and Kuala Lumpur, Malaysia. Are you Malaysian? Your explanation about Malacca or places in Malaysia is so detail and I really like it. 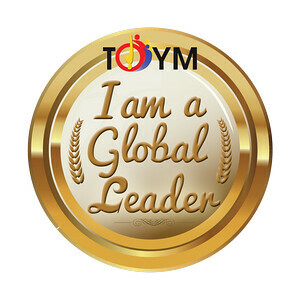 Thanks for great blog posts. Wow... Malacca!! This is the place where I really love going back to. I was in here in 2007 and I did threw a coin in the well of Han Li Po Well. I was able to visit again in 2008.
thank you for featuring melaka. i love going here. its quiet and quaint.